Image is a public domain file via Wikimedia. Ouija boards (pronounced wee-jee) are one of a great many tools commonly used for the purpose of divination. The board's name is commonly said to have been created by blending the German and French words for "yes". But there is another explanation believed to be more accurate. It holds that a group of board users, including Elijah Bond and his sister in law Helen Peters, had consulted the board and it had named itself. Asked what the word meant, it is said to have replied "good luck". The word itself is trademarked, and at this time is owned by Hasbro. Generally speaking though, people apply the term to virtually all similar boards applied to the same purposes. The idea of a Ouija board (also called a "spirit board") is to spell out answers through the movements of a heart-shaped wooden or plastic object, called a planchette. Those using the board place their fingertips on the planchette, ask a question, and then wait for the planchette to glide across the board. Once it does it moves from letter to letter, or to one or more numbers, or to one of the few words on the board - yes, no, or goodbye. It’s a commonly held belief that Ouija-style divination is a relatively recent invention, but it isn't so. There are references reaching as far back as to the Chinese Tang and Song Dynasties, 618 - 1234 AD. During those times a technique referred to as "fuji" (also "fuluan") was used. Though not the same process as Ouija, it was a form of planchette writing, and in that sense was quite similar. For centuries the practice was accepted as a means of receiving messages from the spirit world, until it became taboo during the Qing Dynasty (1644 - 1911 AD). In fact, Daoist scriptures are reported to have been strongly influenced by planchette writings. 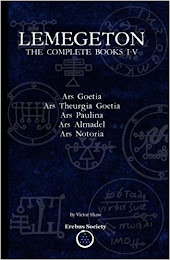 Similar styles of spirit writing were practiced in other places as well, including Greece (540 BC)¹, Rome (recorded as being used at a trial in 371 AD)², and in Medieval Europe³. More recently though, Ouija boards have been sold primarily as novelty items. The game was created by Elijah Bond, and was first patented on February 10th, 1891. 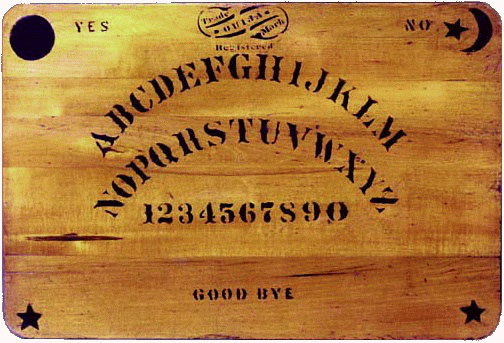 William Fuld, an employee of Bond's, ended up acquiring the patent; but his first patent for a spirit board appears not to have been for an identical product to Bond's Ouija, it was much the same concept though. It was a few years beyond this particular product patent, that Fuld gained ownership of the one held by Elijah Bond. The patent was owned by his family until the 1960s when they sold it to Parker Brothers, which eventually became Hasbro. It’s a board with a planchette, so you may well ask how it does anything. Believers in the Ouija board will tell you that you use it to make contact with those who have passed on, spirits both good and evil. Supposedly, the spirits that choose to respond use their telekinetic energies and the group’s combined force of will to move the planchette around. This in order to provide the group or solitary user with answers to their questions. While a board holds no power of its own, it has been used as a tool to get closure, find answers and solve mysteries. Some believe that the planchette only moves when directed, and that the user’s subconscious is providing the answers that were so desperately sought after. The truth is, that we just don’t know. Subconscious, spirits, whatever; no matter what moves it, you have to know that if lore serves correctly, you need to be cautious to participate in using it. There are possible hazards when you meddle with occult unknowns. While the Ouija board is an acknowledged way to contact the dead; it is of course possible that a malevolent spirit may end up controlling the planchette with less interest in what you want to know, and with perhaps a more sinister intent. There have been reports - documented cases of people that have used these boards without proper precautions, or that have used them too often, or that have contacted the wrong sorts of spirits; and in instances they have ended up being institutionalized as a result. There have been reports of such mysterious happenstances as planchettes flying about, or moving without anyone touching them. Some suggest that to use Ouija opens up a possibility for demonic possession to occur. Possessions are claimed to be most likely to happen to people with an unstable subconscious mind; so it goes without saying that for such people, Ouija is not a toy of choice. But then again, those who are mentally unstable in any way, won’t necessarily recognize it. It is claimed by some, that as long as you are mentally stable it’s safe for you to use a spirit board; and that therefore as long as your group is sound, your experience should be a good one. Me - I question this statement. There are too many unknowns, and too many reports from seemingly sane individuals of disturbing incidents. What I will suggest is that you use spiritual protection, and not participate if your spiritual vibration is low, i.e., don’t engage if you feel down at all, wait until you feel to be your tip-top self. Also, be aware that tricksters are just as prevalent as the good spirits. Recommended protection would be for you to recite a simple prayer of protection, or to call upon your protector guide, or to incite elemental protection. As well, sound advice would dictate that though there are designs of this board that seem targeted towards youngsters, children should not use this ‘toy’ when they cannot possibly comprehend what they are getting involved in. I will now offer you the link to a related and thought-provoking article. This piece suggests that it has been conclusively proven that Ouija works entirely through the "ideomotor effect" (on pg. 4); and I am certain that there are those who will fully accept that. However, it's through the subconscious mind that we receive and process messages from the spirit realm. Can the subconscious act as a gateway for spiritual entities and events? Who knows, maybe with certain elements present, such as holding certain beliefs, i.e. 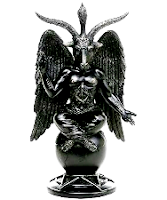 - believing that spirits can possess you and/or having a lower spiritual vibration level; or either intentionally or unintentionally inviting spiritual entities across. And what about an unknown, such as you think your friends are mentally stable, but do you know that for sure? As an additional thought, if you do read the article found via the link above, don't you agree that if people were set up to believe that the board worked through the ideomotor effect, that it would unduly influence their existing beliefs? Through that suggestion, the mindset that those subjects would normally possess had been thoroughly interfered with... so it certainly wasn't a pure and scientific experiment that was conducted. I leave this point for you to consider. As older teenagers, a friend and I had an experience with a board. When the planchette moved it was for real, and it traumatized us. We never spoke of it again. You just can't tell where that stuff is coming from. I knew without a doubt that neither one of us would ever touch one again. Not that we didn't believe in divination, today I am a Tarot card reader. We were alone in a dark house at the time... it was scary. Perhaps we weren't ready, yes, that may well be it. And too, the energy present, I can recall it still today - it was so creepy! It is a breath of fresh air to conclude with the fact that this general concept has been in use for thousands of years under many different names. Ouija boards, when used properly and for the right reasons, may well be a great tool for divination purposes. Point being - do some research and become knowledgeable first, and hopefully that's the key. ... and by the way - don't forget to close your session with "goodbye". ¹ Upheld here: The Museum of Talking Boards (website); and disputed in the eBook "The Maverick Ghost Hunter"; by Jack Lockwood. ² The Outline of Parapsychology; by Jesse Hong Xiong. P. 237. ³ Medicine in the Middle Ages: Extracts from 'Le Moyen Age Medical'; by Edmond Dupouy. P. 75. Example Ouija Tales: There are many such stories to be read on the Internet. Are any true? Some not likely, some partially, and others - absolutely. But who knows where they each came from; interesting related reading just the same.